The windshield wipers slosh away a light mix of rain and snow while I cut through the forested mountains of the Santiam Pass. Every fifteen minutes or so I pass through a small town with a population smaller than the amount of friends I have on Facebook (and I am no social media butterfly). The storefronts are nothing more than empty shacks made of rain-swollen wood and covered with moss since the local pizza place, burger shack, or general store closed down. Their populations have dwindled to almost nothing over the past twenty years. I know this because I grew up in one of these small towns. Sure, the Spotted Owl took a toll on our economy in the late 80’s but that isn’t what killed us. It used to be, when I grew up, my family would pack into our giant green Plymouth Stationwagon and drive down to the mountain to the big city of Springfield, Eugene, or Salem to do our once a month shopping, but only if we needed big things like kerosene for the heaters, school supplies, or new clothes. Most of the time we shopped at Phil’s Fine Foods in a small town called Rainbow only a few miles down the road. Phil was a great guy who would have a holiday party for his employees every year. I remember he would always give me a free bag of Skittle at the register to keep me busy while my grandmother wrote a check and Phil’s son bagged our groceries. 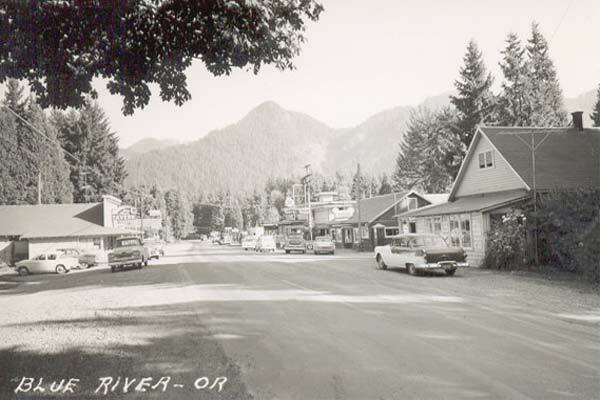 When the Wal-Mart opened up in Lebanon, Oregon, in 1992 just about all the families living up the mountain were overjoyed. It meant we didn’t need to drive so far during our monthly trips to town and the prices were significantly lower than Bi-Mart or the malls. The trip saved us so much money that we could even head down the pass twice a month. It only took two years before Phil’s quietly closed its doors and went out of business. Soon, so many people made more frequent trips for low prices that suddenly a McDonald’s popped up along the way in the small town of Sweet Home putting Busy Bee Burgers out of business. Pizza Hut replaced T&M Pizza. The Wal-Mart became a Supercenter in 2003 and just this month another Wal-Mart is opening only fifteen miles west of Lebanon in Albany. Bend has two sets of outlet malls, a Costco, and a Wal-Mart Supercenter and ten miles away the smaller town of Redmond has more for sale or lease signs than storefronts downtown and the only businesses thriving in the surrounding areas are national chains. By my senior year the small town of Blue River consisted of not much more than a liquor store, a gas station, and blocks of dilapidated buildings that had been boarded up for years. Just about all of the Mom and Pop Stores up the mountain had been driven out of business making it more inconvenient for people to buy their goods unless they drove down the pass, this caused many people to relocate closer to the cities. The jobs left. High schools merged. Teachers laid off. Fewer people meant less property tax, which meant smaller county budgets, which meant fewer county and state jobs. Soon the small town of Nimrod and Fin Rock disappeared from the new maps. Eighty percent of my graduating class joined the armed forces and I know for a fact most of them did so because there was no future for us in the mountains, no jobs, no hope for college, and we all had a sick feeling in our guts from watching our towns die slowly for years. I didn’t want to join the military. I wanted to be an artist and a writer so I stuck around working for the only employers who were hiring: Supercenters and Supermarkets. These places didn’t throw holiday parties for their employees or give out free Skittles to a crying child. In fact, most of my coworkers were on foodstamps and welfare; something, again, I didn’t want to do. I held out two years before enlisting in the army infantry. After a fourteen-year career in the military I returned to Oregon. The military allowed me to get my undergrad and masters degree. I now live in Portland and manage about a hundred security officers around the state so I drive from Medford to Portland and Salem to Bend about twice a month. I look around our state now and see these Retail Giants coming in promising jobs and low prices but most of these new jobs don’t pay enough causing their “associates” to seek state and federal welfare. They do this while receiving tax breaks for simply bringing their store to a new area. Small businesses cannot compete with these low prices and suddenly all the family groceries, tire shops, floral stores, and other businesses that make a small town unique disappear. We are losing our contributions to Americana and soon our city looks identical to one in Texas, Alabama, California, et cetera. I know because I’ve been in those cities. The military taught me discipline, which is what we need to beat this thing. We need the discipline to choose the local Mom and Pop Store over a National Chain, to choose to spend a little more money on our products if it’s American made, and even better if it’s locally made. We need the discipline to choose the hard right over the easy wrong. We all need to think about where our money is going when buying any product and take money from the corporate CEOs and put that money into our local economy. Give your neighbors small business your money instead of sending it off to be part of a million dollar bonus of someone who couldn’t spend all his money in ten lifetimes. If we lose our regional identity we lose what it is that makes us American. Let us invest in ourselves.